Size: * 3" 5" 7"
The Honey Candles® Natural Round Pillar is eco-friendly and good for your health, with absolutely no carcinogens or hazardous ingredients, wicks made with cotton, and all natural ingredients. The great thing about beeswax pillars is that they produce unique compounds as they burn, which neutralize airborne allergens and toxins. 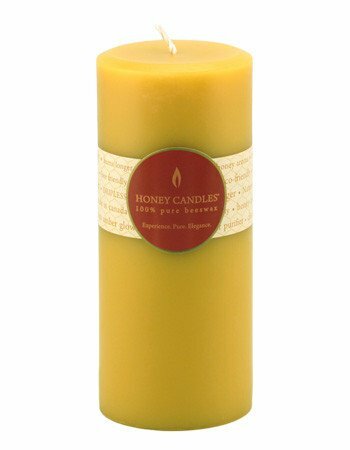 You'll breathe the difference pure beeswax candles make. Plus, beeswax candles produce a natural glow that is closest to sunlight. Burn time approx 35-45 hours for the 3", 55-65 hours for the 5", 85-95 for the 7"